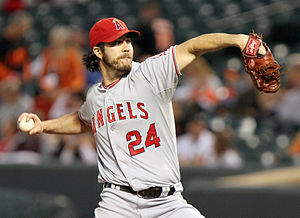 The Nats filled their 5th starter hole today, signing Dan Haren to a 1yr/$13M deal. Haren looks like a possible fantastic pick-up for this rotation, giving them a legitimate #2 MLB starter capable pitcher to supplement the four returning rotation members from 2012. He’s a sinker-ball pitcher (throws the sinker 34% of the time) who can reach 90-91 and throws a large variety of pitches en route to a career 7.6 K/9 rate. I think he just may be fantastic in the NL east. Even Keith Law likes the deal, a surprise since I can’t remember the last time he “approved” of a deal the Nats have made. Haren struggled with back issues off-and-on in 2012, depressing both his numbers, his velocity and his free agency value, but heretofor was an incredibly durable pitcher (he’s averaged 219 innings per 162 games over his entire career, throwing 238 1/3 in 2011) with a penchant for putting up lights-out numbers (he had a 1.003 WHIP for an entire season in 2009 for Arizona, pitching in a hitter’s park). Law noted that back issues all year were the cause of both his dropped velocity and his rising sinker, leading to his elevated ERA, and that a healthy Haren should have no problems returning to his typical form. Some have noted concerns about his hip (sportswriters tweeting that Boston reviewed his medical records and passed on signing him), but others have noted that the Angels (who seemingly know his medical history the best) had a 2-year deal on the table. If the Angels wanted him back, I’m more confident that the Nats don’t have damaged goods on their hands. I really like this deal. Haren was on the second-tier of free agents that I thought would be good fits here (Dempster, Sanchez, McCarthy being other examples) but I never thought he’d leave Los Angeles. I understand why he was forced to sign a one-year deal (a very ill-timed injury plagued season, in his contract year), but he now has a chance to move to the NL, rebuild some FA value and springboard into 2013 free agency much as Edwin Jackson did last year. I have always considered him a near-Ace pitcher in this league, and it may be the Nats great fortune to get him on a one year deal. Re-Sign Adam LaRoche and/or install Michael Morse at first for 2013. Maybe sign one more lefty, possibly Michael Gonzalez (or not, if you’re confident that Bill Bray is healthy). Maybe pursue some middle infield depth, looking to replace the Mark DeRosa role from 2012. Coincidentally, does Haren’s signing mean the team is no longer looking to move Morse? Lots of the talks with Tampa and Baltimore seemed to surround trading for MLB starting pitching. But now there’s no room in the rotation. Maybe now we’re looking to trade Morse for prospects instead of MLB ready guys, a move I’m completely on-board with given the farm system drain of our starters lately. Subscribe to comments with RSS or TrackBack to 'Dan Haren; another excellent signing'. I agree with you, this is is a terrific signing. Potentially throwing money out the window but with a very high upside. As much of airheaded move the Span trade was, this is smart baseball. Starting the offseason I thought there would be a trade with Tampa Bay for a pitcher, but with Meyer gone there just wasn’t much left to trade in the minors and we’d be looking at losing Espinosa & Morse to get something done. Hey, its not my (or your) money. Given the choice of spending money and trying to win and not spending it and not having as good a chance to win? I think we’d all go win now. I can still see both Espinosa and Morse being moved, except now for prospects and not someone like James Shields. I think the team can use lombardozzi as a stop-gap at 2nd until Rendon is ready, and I think the team would rather jump up payroll a bit more w/ LaRoche instead of installing Morse at first. Both these trades can help supplement our barren farm system and I’d be onboard. Rule 5 draft; I can see us taking a flier on both a left handed reliever and a middle infielder. But we’ll see. We may just stand pat. Man, if he is healthy, this could be awesome. In his prime, this guy was a #2 on a contender. He probably is a little past his prime but if healthy, he should still be a top 40 pitcher. And you are right, it is only dollars in a year their payroll can handle it (and, if he does well and leaves, presumably we tender him and get a pick). I guess that I agree, bring back ALR and flip Morse for prospects. But it is ok if Morse stays and plays 1B too. I’d keep Espy now though. If they had flipped him for a pitcher, ok but no need now. It’s a hard and fast rule, the money isn’t the killer, it’s the years. Just to make the Nats look smart, the Red Sox just paid 3 yrs. $39 mil to Victorino, who’s not even an average player anymore. Dumb. 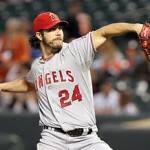 I also love the Haren signing since it puts the Nats in the discussion for having the best rotation in baseball. I’m NOT, however, really down with trading Danny E as a result. The only way I would have been content to see him go would have been in a deal for a front line starter like James Shields. Since that didn’t happen, we need to give Danny that third year like Ian last year to see if he can reach his potential. If so, we then have a fantastic all-All Star middle infield. On the other hand if he remains about what he is now, trade him next offseason and then make Rendon the heir apparent. I think the most indefensible contract so far this off-season has to be the Guthrie deal. 3yrs/$25M for a guy with worse career numbers than John Lannan. I heard a podcast with someone bitching about Dayton Moore and using this as just one more example of how bad he is at his job. Teaser: I’m working on a GM rankings post to talk about just this topic. Boston always gets passes on FA deals though, since they’re routinely #2 or #3 in total payroll and everyone expects them to have a $175M payroll. $3/39 for victorino doesn’t sound *awful* … but yeah its an overpay. But lets be honest; isn’t EVERY contract we’re seeing considered an overpay right now? I think the new TV monies pouring into the game are going to make the players much richer, and contracts that we think are overpays now will look like underpays in 5 year’s time. I don’t see Haren deal implying an Espinosa trade directly. I mean, Espinosa is still pre-arbitration so he’s incredibly cheap and thus has negligible payroll impact. I do see Haren deal eventually leading to Morse’s exit, so as to save his $6.75M payroll in 2013 (I’m assuming we’re resigning LaRoche, despite the 2yr/3yr hang up. I mean honestly, the guy’s only 32 … a 3 year deal isn’t that bad. Make it a 2yr plus an option based on PAs or homers or some bs). I honestly can argue both sides for Espinosa. Side A: Espinosa is a SS by trade, therefore surplus to our requirements and he has value being shopped as a plus defense/fantastic arm SS with 20 homer power, despite his K rate. We’re wasting him by playing him at 2nd, since we have cover for the position plus prospects on the rise. I think we move him for prospects to help rebuild our depleted farm system, put the able Lombardozzi there in 2013, find a utility infielder in Rule 5/FA market and there’s your team. Rendon may be ready in mid 2013, ready to start in 2014 and the team needs to keep its options open for a guy who was a 1-1 talent. Side B: Espinosa is entering his 3rd full season, which is the same season that Desmond went from an 80 OPS+ player to a 126 OPS+ player. We need to keep the nucleus together, need to give Espinosa one more season to “figure it out,” and we will be rewarded for it. The team has showed patience before, and flipping Espinosa would be impatient and could be a move we regret if he turns into the second coming of Chase Utley. I tend to favor Side A, moving him now frankly.